Greetings everyone! Hope you are having a good time ushering in the holiday season. 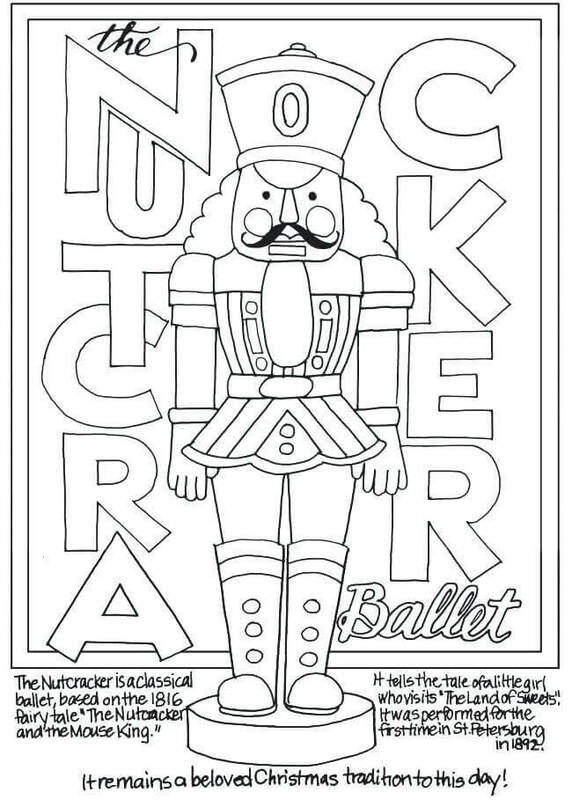 In case you need some help, today we have brought you a collection of the Nutcracker coloring pages. 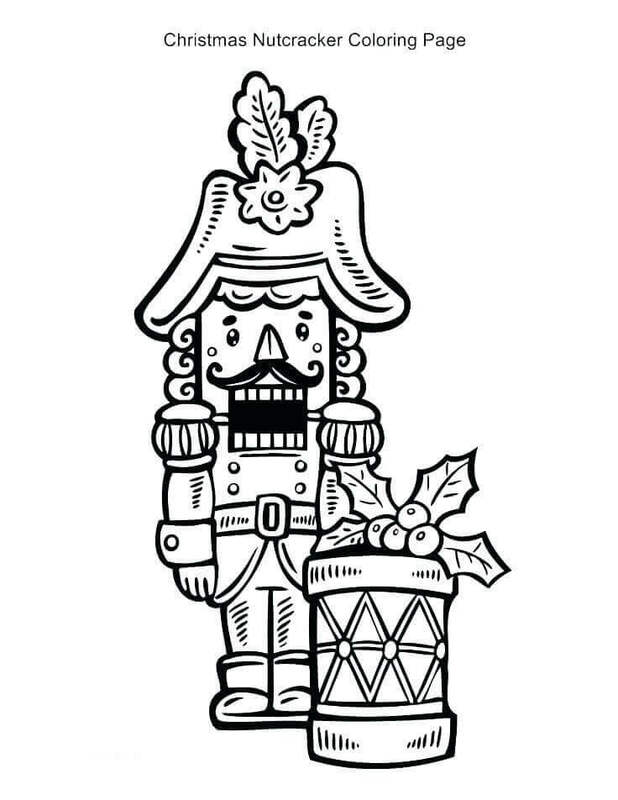 Nutcrackers are dolls or figurines that has its origin in Germany around the late 17th century. These dolls came into prominence after E. T. A. Hoffmann wrote the story “The Nutcracker and the Mouse King” in 1816 which was turned into a ballet “The Nutcracker”. The ballet, which premiered in December 1892, was based on an adaptation by Alexandre Dumas of the original story. The popularity of the ballet catapulted it into the consciousness of the world and has now become an annual holiday tradition. 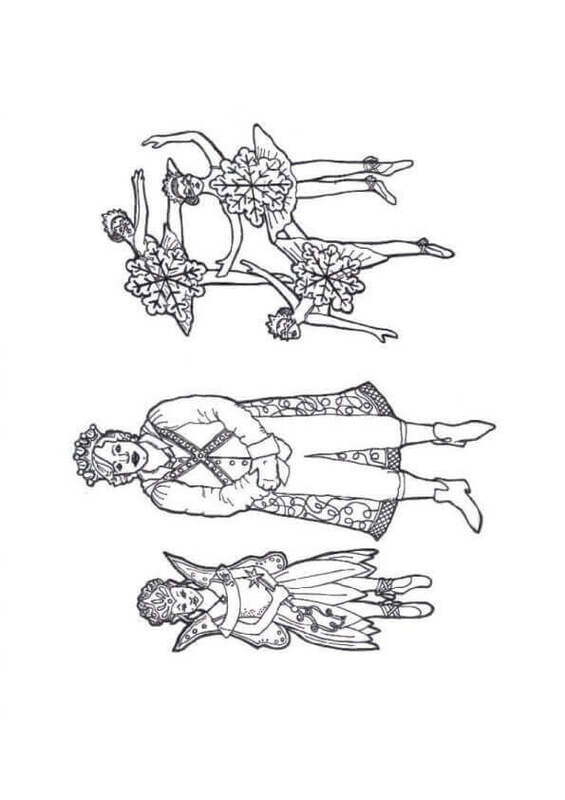 Let’s get to know more about the dolls, the original story as well as the ballet, through this collection of Nutcracker coloring sheets to print. Barbie entered the world of the Nutcracker in 2001 animated movie “Barbie in the Nutcracker” which shows her encouraging her sister to keep practicing her ballet moves by telling her the story of the Nutcracker. 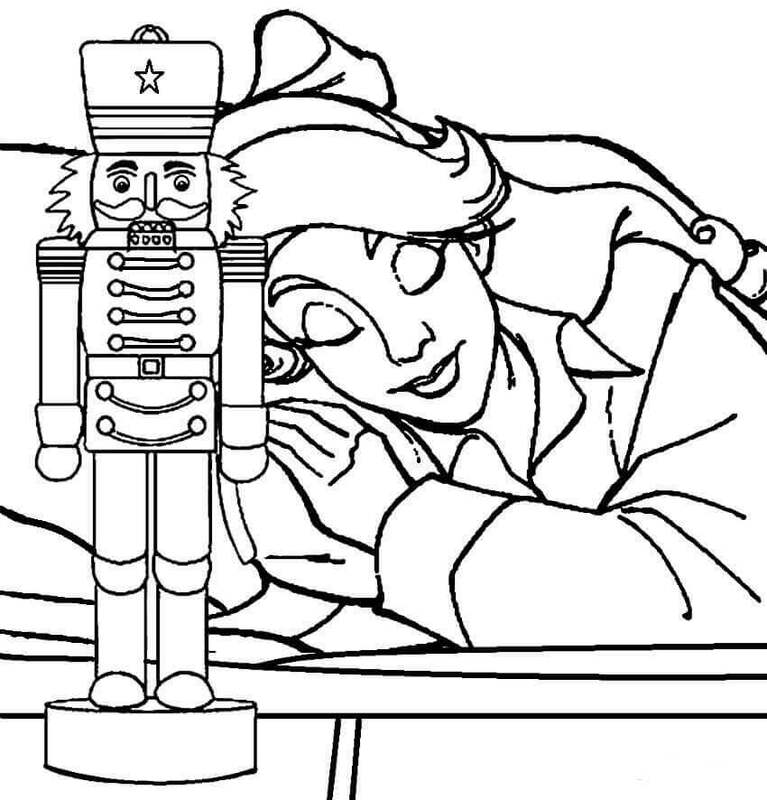 Give this sleeping Barbie a beauty sleep and make the Nutcracker come alive with your brilliant coloring skills. “Barbie in the Nutcracker” movie was a huge hit with total sales coming to $150 million. Celebrating this achievement seems to be the Barbie dolls in this illustration. You can print this page and add to their happiness by coloring them in triumphant colors. Nutcrackers dolls are figurines that resemble a toy soldier. Popular as Christmas gifts for children, they have also become one of the most common Christmas decoration items. 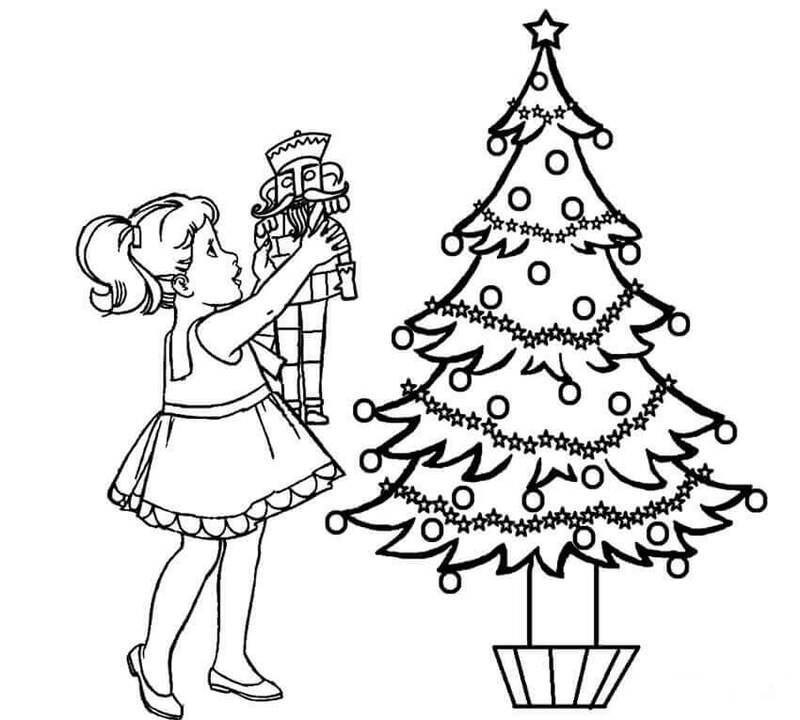 You can print this Christmas Eve scene and individually color each item in exuberant festive colors. The original story revolves around a little girl of the Stahlbaum family who gets a toy, the Nutcracker, as a Christmas gift. When the toy comes alive, a magical adventure ensues. 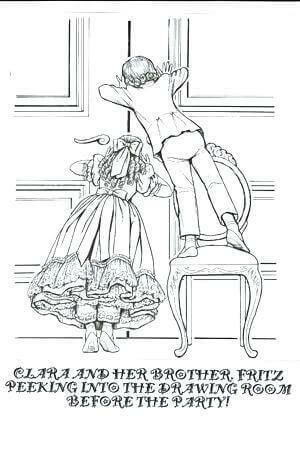 Clara seems to be worried about the Nutcracker in this illustration as Fritz, her naughty brother had broken its jaw. 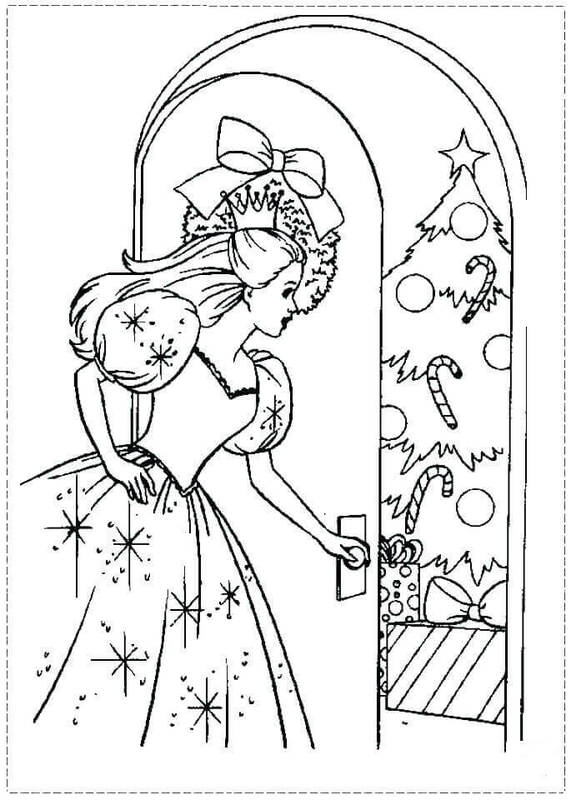 Let your sincere care show by printing and solemnly coloring this page. The name of the girl was Marie in the original German story. However, it was changed to Clara for the ballet adaptations. What is Clara doing here? She seems to be sneaking into the parlor to check up on her presents. You must have done the same too during previous Christmases. You can print this page and mark this sneaky moment in colors. Let’s see if you remember the origin of the story. 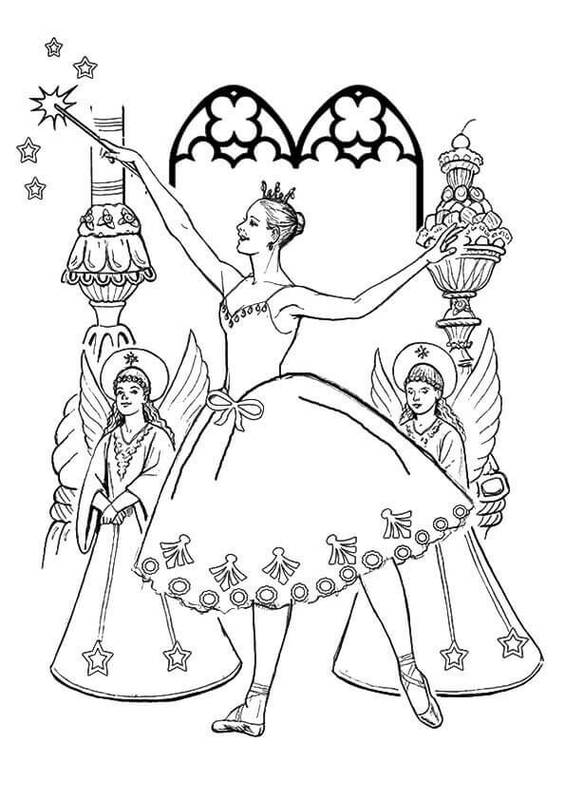 In case you need a quick revision, you can take a printout of this coloring page and get working on reading about the ballet noted below the illustration. The story begins on a Christmas Eve party at the Stahlbaum’s residence. 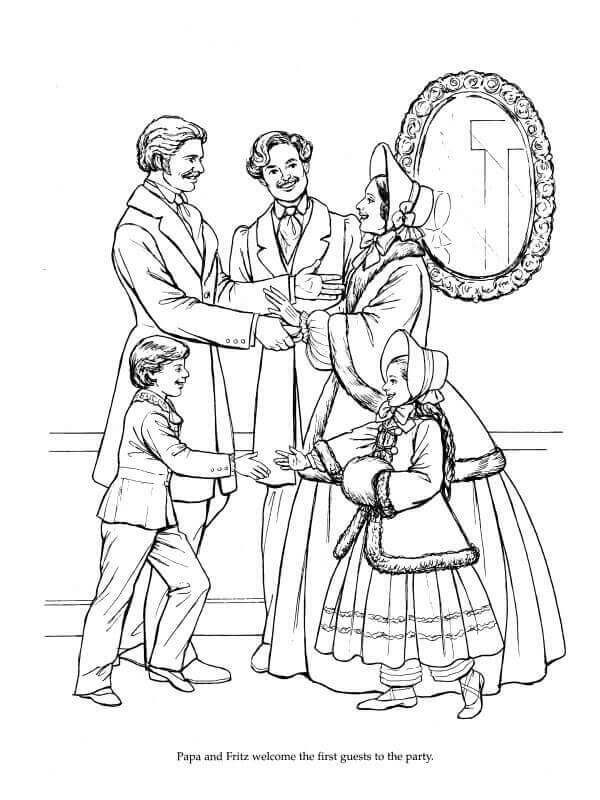 In the accompanying illustration, you can see Clara’s father and her brother Fritz heartily welcoming their first guest. 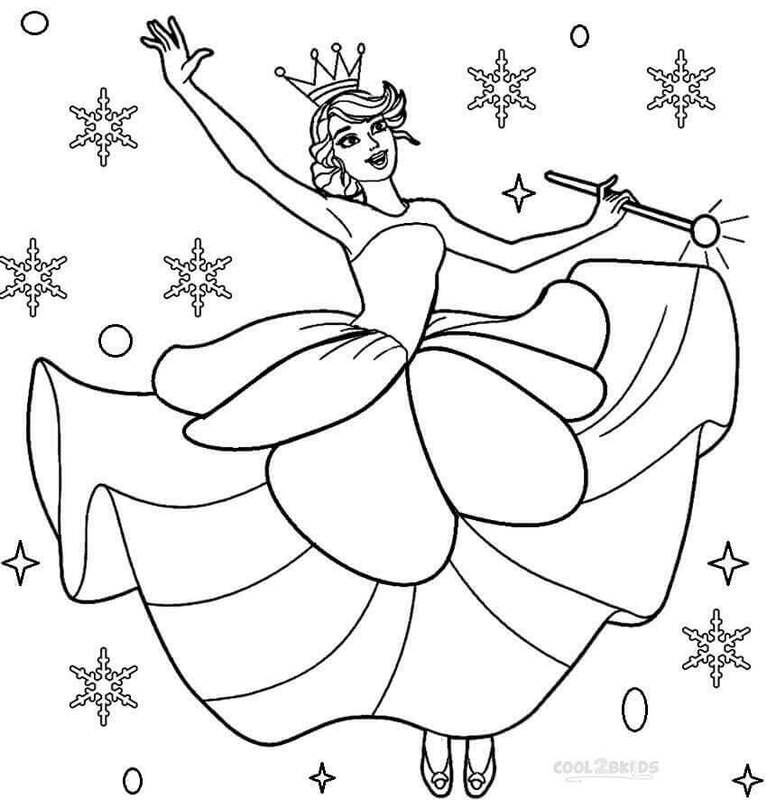 Impart an atmosphere of merriment to this scene by printing and coloring this page. Clara is so enamored by her gift that she does not even look at the well-decorated Christmas tree. She is busy playing with her Nutcracker doll. This must remind you of how you too get lost while you are playing your games. It’s time now to print and concentrate fully on coloring this page. 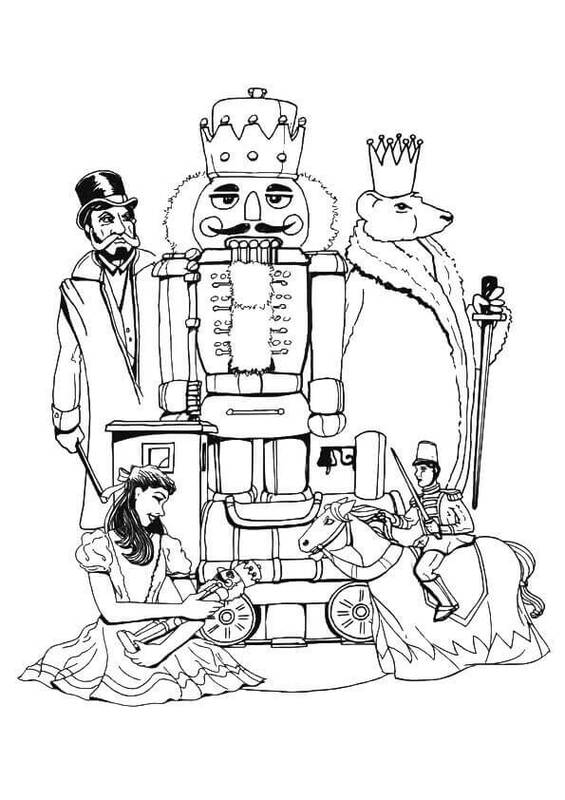 Clara’s godfather, Drosselmeyer who is a clock-master and an inventor, had gifted the Nutcracker along with other gifts to her and her siblings. As Clara was fond of the toy, he appointed her a special caretaker of the Nutcracker. It is such a happy feeling to receive a gift you want, isn’t it? Print and color the happiness in this illustration. Happy and satisfied with their gifts, the children are busy playing with the Nutcracker. They seem to be having a fun time this holiday season. Print this page and elevate their happiness by coloring it. “The Nutcracker and the Four Realms”, a 2018 Disney movie, was created as a sequel to the original story. A young girl receives a locked egg from her late mother and journeys into a magical land to find the key stolen by a mouse who ran off to the Fourth Realm. On her quest, she meets Captain Philip Hoffman who guides her to the castle where she meets the regents of three lands, at war with the Land of Amusements, also known as the Fourth Realm. Stunningly illustrating the scene of their arrival is this coloring page. The Nutcracker ballet was introduced to the United States in the mid-twentieth century and soon became a holiday tradition. 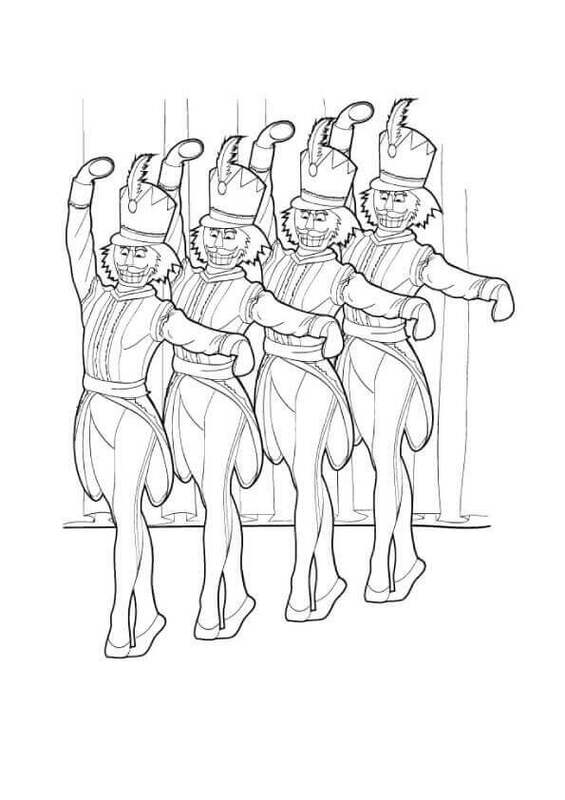 Illustrating one of the many perfectly-poised scenes is this coloring page. Give this picture-perfect scene your best colors. The two-act ballet which first premiered in Saint Petersburg at the Mariinsky Theatre was choreographed by Marius Petipa and Lev Ivanov. The musical score by Pyotr Ilyich Tchaikovsky has since then become one of his most popular and critically acclaimed compositions. The costumes look magnificent, doesn’t it? Print this page and add colors to the characters. 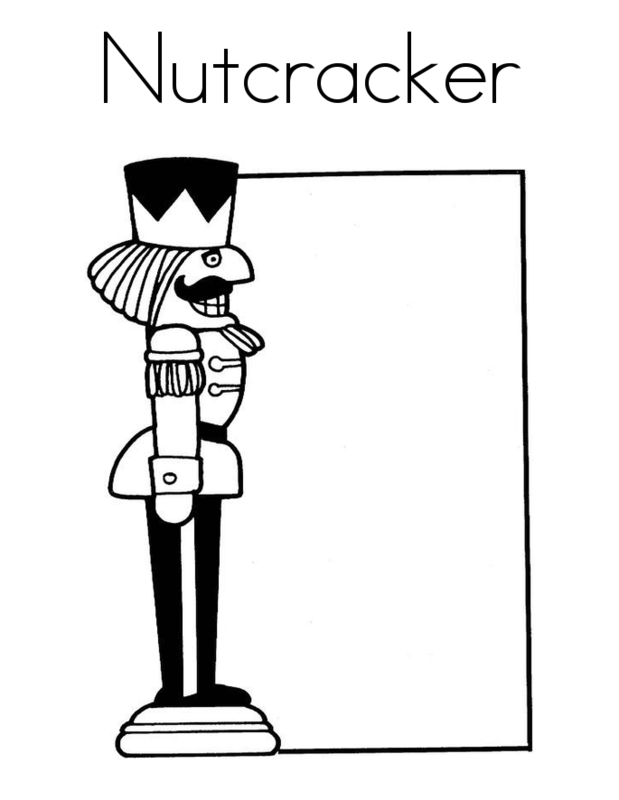 This smart and handsome nutcracker is waiting for his life to become colorful and he needs your help. 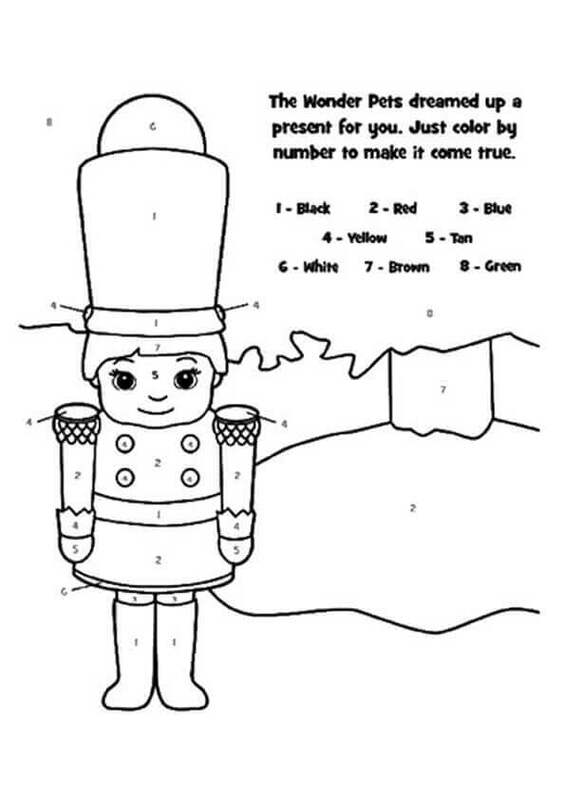 Simply follow the instructions on the page, coloring each numbered segment according to its corresponding color. Although they were created in the late seventeenth century, the popularity of the nutcracker dolls rose around the 19th century. Major contributing factors being the story by German author E. T. A. Hoffman and its subsequent adaptation into a ballet by the end of the century. Print and color this formidable figure in uniform. Traditionally in Germany, the nutcracker dolls are believed to be the symbols of good luck that ward off evil spirits. Don’t the figurines in this illustration look fierce? They will certainly scare off all bad spirits. 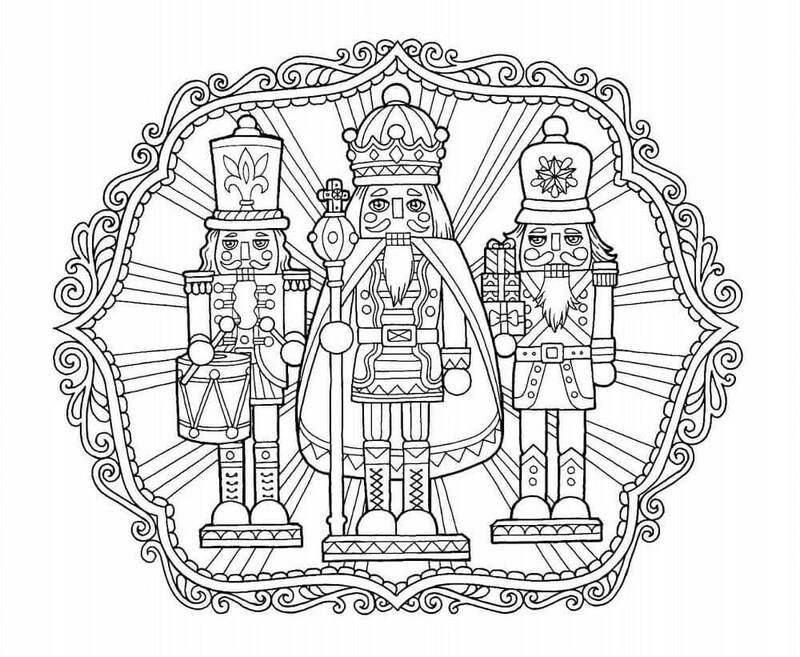 Enhance their persona by printing and coloring this page. The Christmas Eve party is about to start in the Stahlbaum household. Clara and her brother Fritz are already brimming with excitement. Look at how they are trying to peek inside the drawing room! 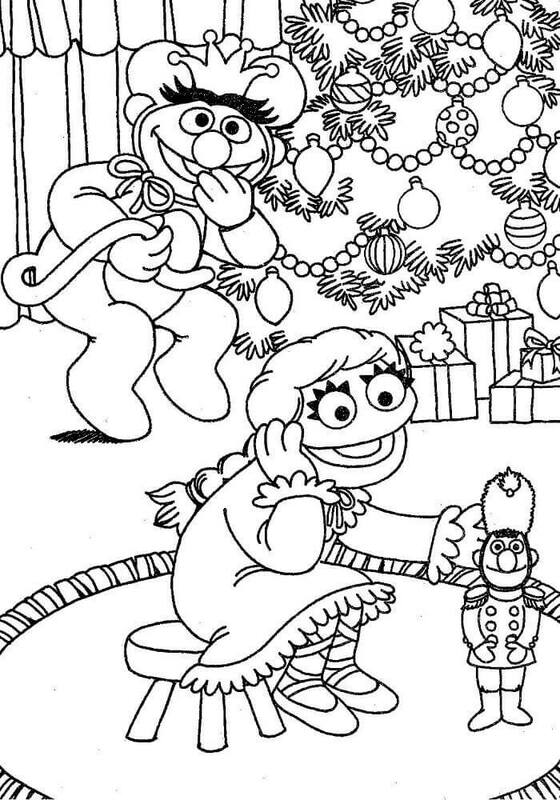 Print this page and fuel their curiosity with your coloring skills. 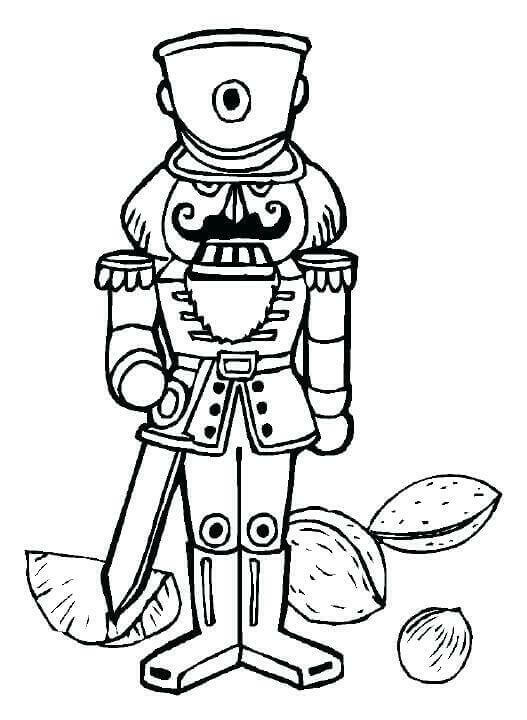 Nutcracker dolls are often referred to as Christmas nutcrackers after they became popular as gifts especially during the Christmas season. 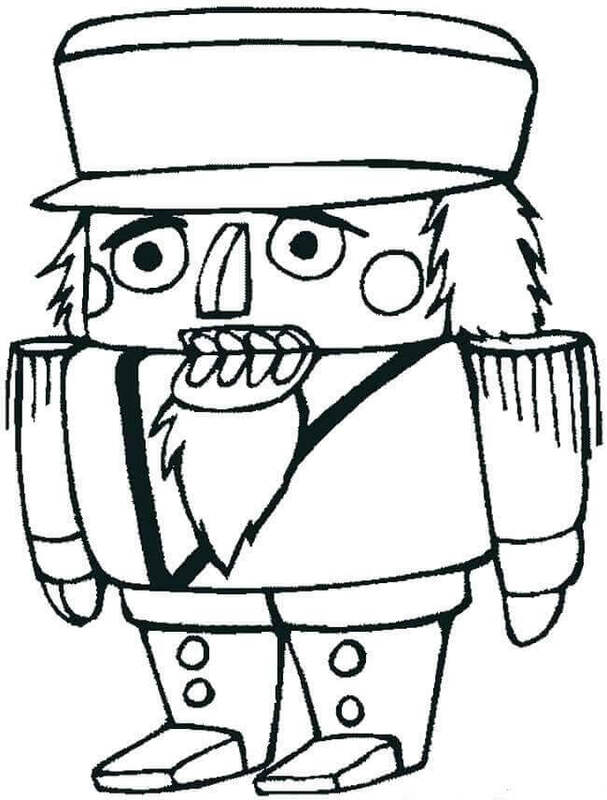 Almost all the nutcracker dolls were functional in the beginning and able to crack nuts like shown in this illustration. However, post mid-20th century, they are mostly manufactured as decorative figurines. Tchaikovsky’s compositions for the original ballet have been used, in parts, in almost all the theatrical as well as film adaptations. Work your magic on this illustration of the film by printing and coloring this page. Through a fantastical tale, the Nutcracker toy gifted to Clara comes alive in a parallel world where they need to defeat the evil Mouse King. He certainly looks vicious, doesn’t he? 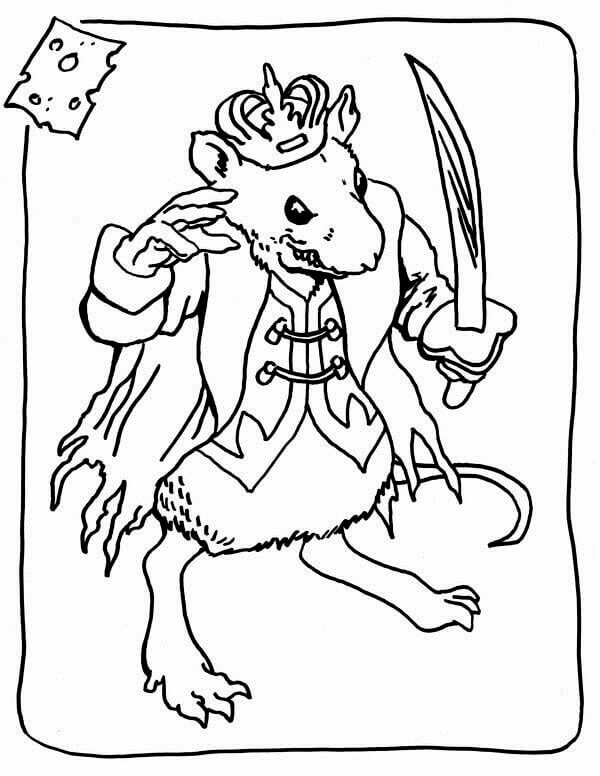 Print this page to capture this horrid persona of the Mouse King. 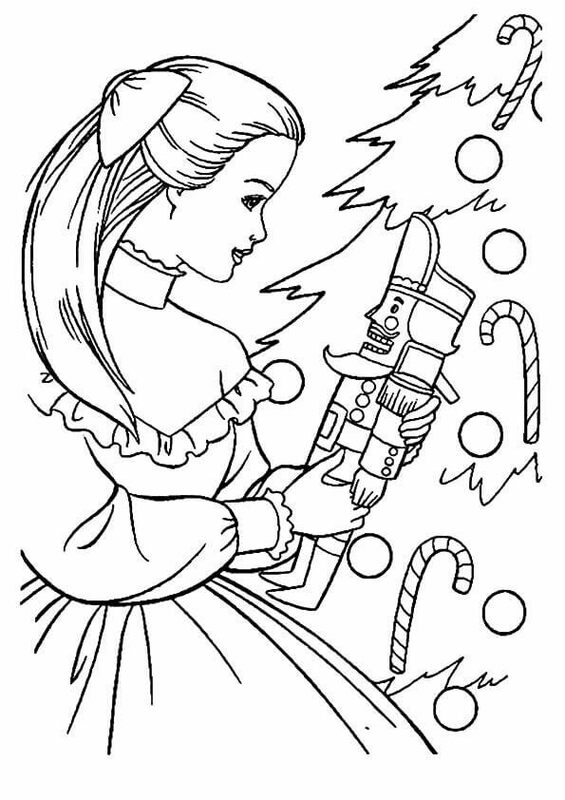 You can make a greeting card or a postcard using this coloring page. The illustration comes with a proper outline and space for your messages. 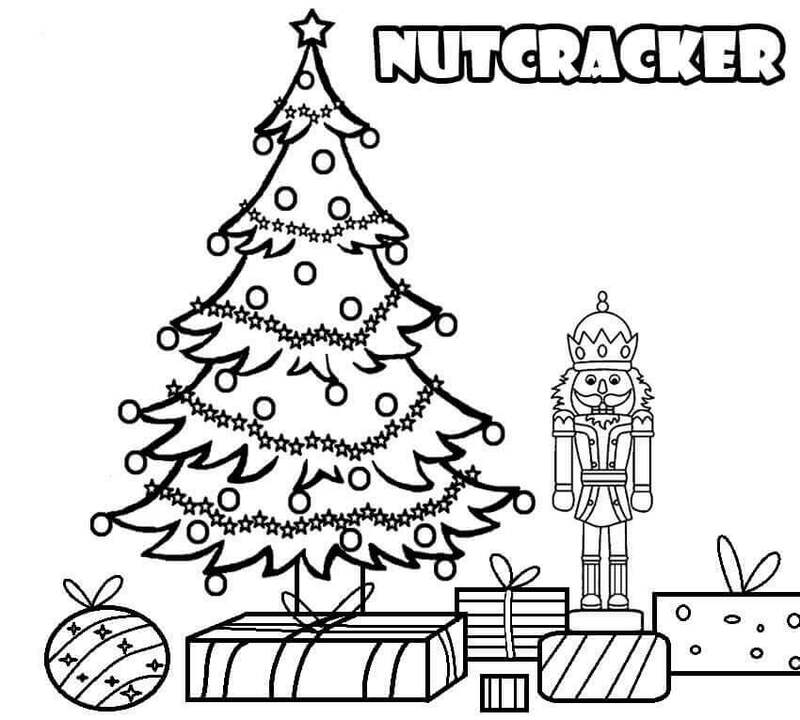 Print and carefully color the Nutcracker and write messages to your family and friends. 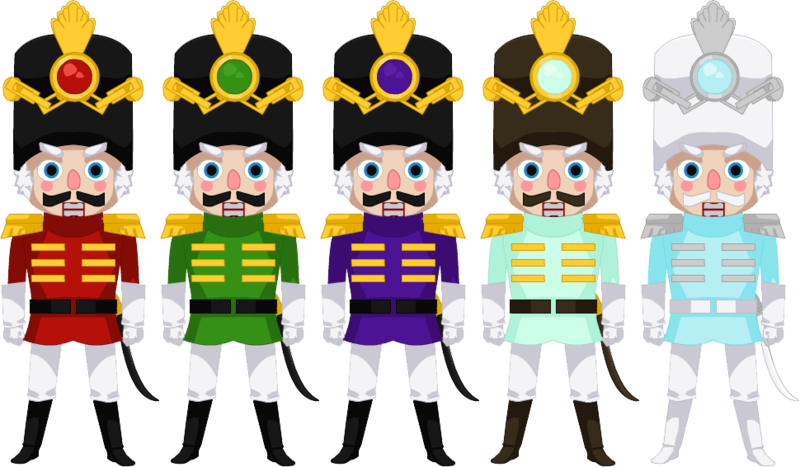 Earlier the nutcracker dolls could be of different figurines, but they have since graduated to being dolls resembling toy soldiers. 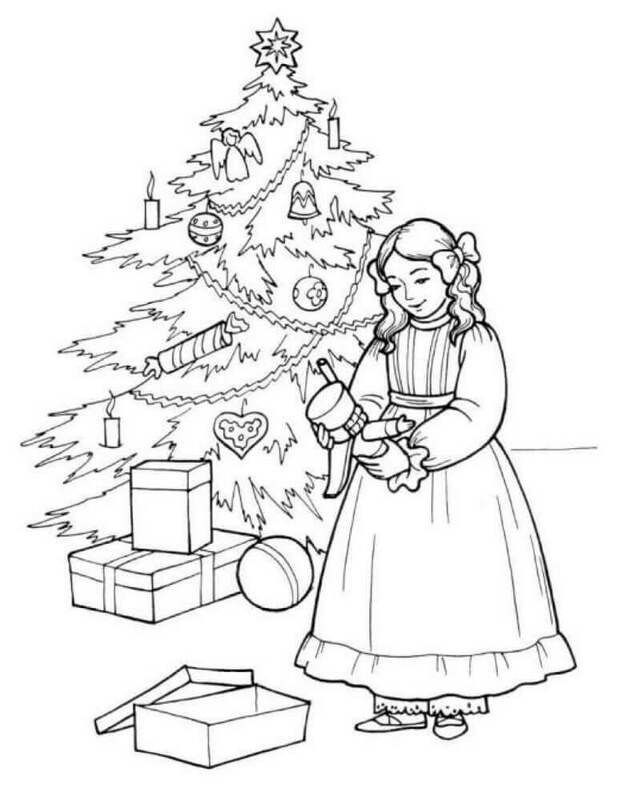 Giving you different examples is this illustration on this coloring page. When Clara saved the Prince by throwing her slipper at the Mouse King and helping him defeat him, the Prince was restored to his normal form. He then takes her to his Kingdom, the Land of Sweets, ruled by the Sugar Plum Fairy in his absence. To welcome them a grand celebration is held where the Sugar Plum Fairy performs a dance as well. The majestic Sugar Plum Fairy is seen here in this illustration elegantly celebrating the return of the Prince along with Clara. Print this page and give it an aesthetically grand look with your best colors. 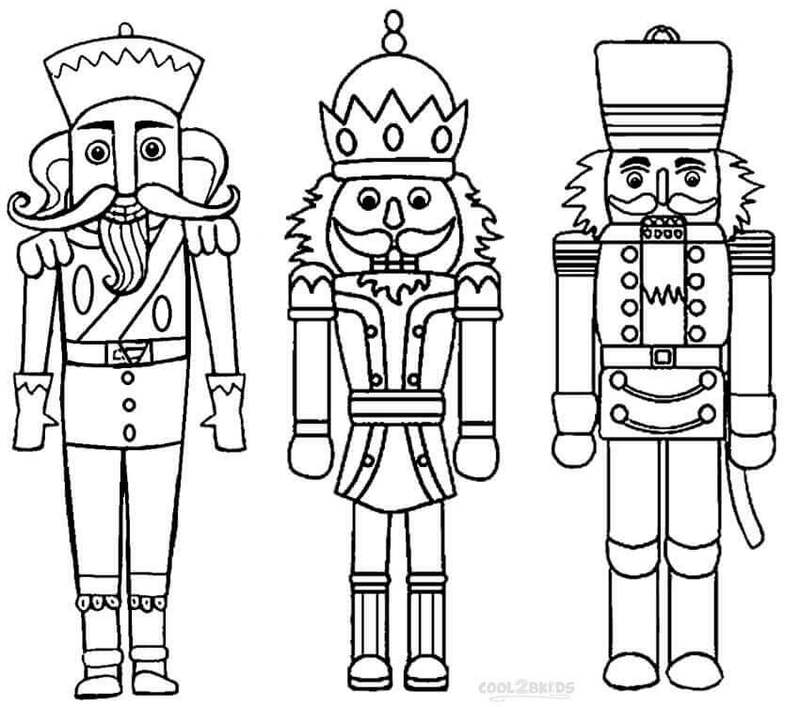 On that celebratory note, we have come to an end of this collection of Nutcrackers coloring picture to print. Hopefully, you were as enthralled by the history and the stories of the origin of the Nutcracker, as the world has been over the last couple of centuries. 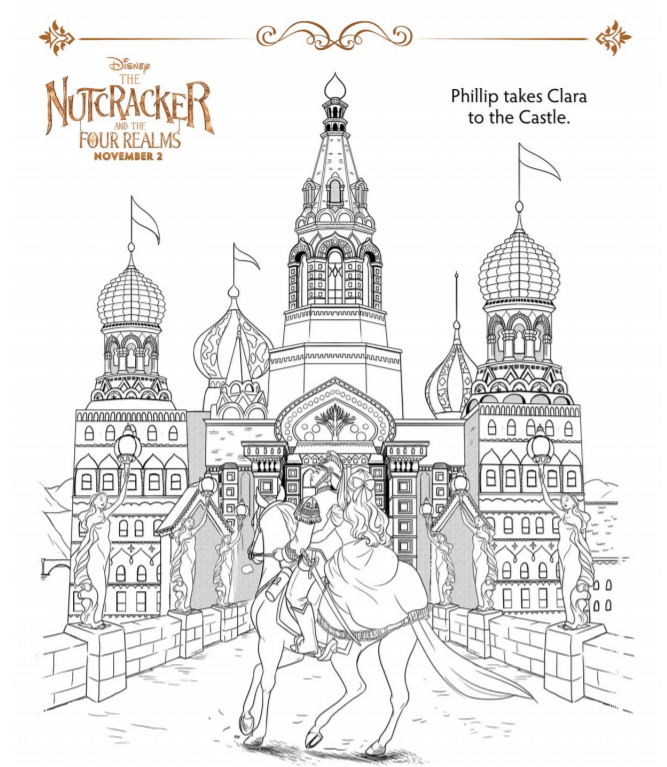 If you wish to visit this magical world again, simply print this collection of Nutcracker coloring pages printable and start coloring.